There are a number of structural repairs required on older masonry building structures with cracks in walls being a common structural defect, often repaired using crack stitching techniques. But what is crack stitching and how does it work? In this article we will discuss this permanent structural repair method and how it strengthens cracked walls. How does crack stitching work? Stainless steel crack stitching bars are inserted into slots that are cut into the wall, usually in the bed joints which can be easily made good. The stitching bars are typically high tensile helical rods having a 6mm diameter and a large surface area by virtue of a profiled deformation having a deep continuous helical trough. WHO60 grout is used to interlock with the helical bars and chemically bond them into the wall, stitching across the crack to reconnect masonry either side of it. The tensile strength of the helical bars is enhanced by its cold worked manufacturing processes and is twice that of rebar, and seven times that of wound helix plate (Ref: BRE GBG62) When used for crack stitching the high tensile helical bars combine great axial strength with rotational flexibility to accommodate natural building movement whist ensuring reinforcement of the cracked brickwork, block-work or stonework. In the majority of cases crack stitching can be used in order to treat cracked masonry of any kind and offers the ideal solution to the problem of cracked walls in order to stabilise a structure. To provide protection against moisture and freeze/ thaw action it is important to seal the crack with epoxy crack filler. How do I know that crack stitching bars will be the most appropriate masonry repair method? You should consider masonry stitching as a repair for cracks in walls that are non-active or cyclic. If the crack is ‘live’ then the cause of the cracking should be identified and resolved prior to stitching taking place. Possible causes for ‘live’ cracking can include failed lintels, ground movement or lack of lateral restraint. If in doubt call in your structural engineer or Find a Twistfix­Re­gis­tered Contractor specialising in crack stitching and other masonry repair systems. Crack stitching is a reliable, rapid and fully concealed method of reinforcing cracked walls. The stitching bars are extremely easy to install and cause minimal disruption making them a popular choice for many. If you have a cracked wall and are thinking about crack stitching as a structural repair method then once the job has been completed then your cracked wall will benefit from quick, strong and permanent repair solution. 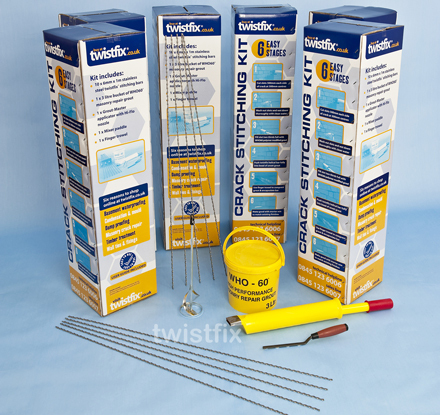 Twistfix supplies everything that you need for crack stitching in our handy crack stitching kit. Why not speak to us today about how we can help you. For more information about crack stitching then please contact us on 0845 1236007 or email sales@twistfix.co.uk.